But you said the water was dirty! I watch a decent amount of TV- mostly news and old shows on TV Land. But I had not seen this til a few days ago. This commercial has been around awhile I guess- it was posted on YouTube last April. Get this. This guy is pouring liquid on the ground and mopping it up with this mega-mop. OK, fine so far. Then he basically says, “In these tough economic times, look, you don’t waste anything! Just wring the mop back into your glass, and drink it!” Really. But he had referred to it earlier as “dirty water.” As a former boss of mine used to say, “Fantastic.” Operators are standing by, so I hope I can order more than one. 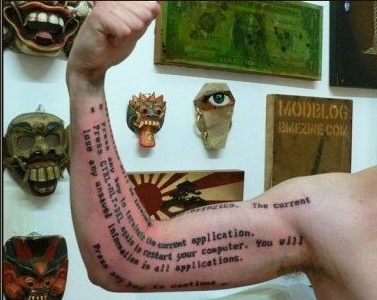 This guy…has a Blue Screen of Death tattoo. I don’t think anything else needs to be said, do you? Oh my God. Much love to Alan for alerting us to this. 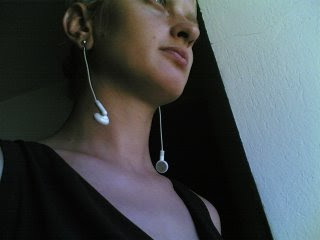 Some idiot has taken old iPod earbuds and turned them into earrings. See more pix here. Look. If anyone spots some frigtard woman actually wearing these — good place to look would be Yelptard parties at SF MOMA, I’m guessing — please snap photos with your iPhone and send them in. You realize that we own the rights to these earbuds and that you can’t just hack them up and do whatever you want with them, right? Jesus.